Jumanji (Collector's Series) on DVD Just $4.00 + FREE Shipping with Prime! You are here: Home / Great Deals / Amazon Deals / Jumanji (Collector’s Series) on DVD Just $4.00 + FREE Shipping with Prime! 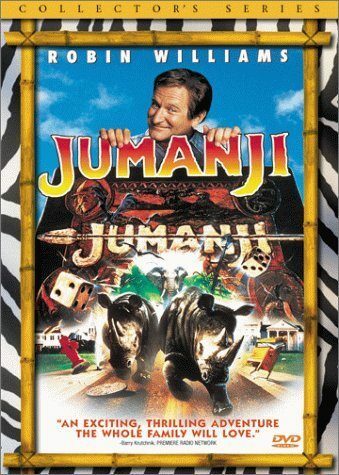 Jumanji (Collector’s Series) on DVD Just $4.00 + FREE Shipping with Prime! Head over to Amazon and get the Jumanji (Collector’s Series) on DVD for just $4.00, down from $14.99. Shipping is FREE with Amazon Prime or an order of $35 or more. Robin Williams, Kirsten Dunst and Bonnie Hunt star in this phenomenal adaptation of the award-winning children’s book. When young Alan Parrish discovers a mysterious board game, he doesn’t realize its unimaginable powers, until he is magically transported before the startled eyes of his friend, Sarah, into the untamed jungles of Jumanji! There he remains for 26 years until he is freed from the game’s spell by two unsuspecting children. Now a grown man, Alan (Williams) reunites with Sarah (Hunt) and together with Judy (Kirsten Dunst) and Peter (Bradley Pierce) tries to outwit the game’s powerful forces in this imaginative adventure that combines breathtaking special effects with an enchanting mixture of comedy, magic and thrills.